Need help with antique doll. 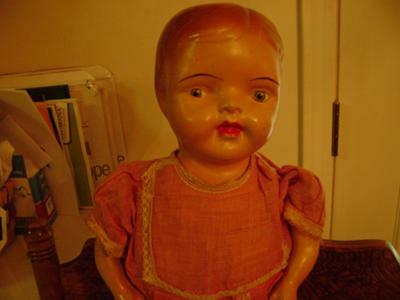 I was given an antique doll by a friend. 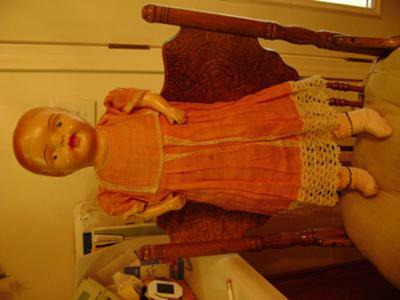 She was around 90 years old and had kept the doll in an old trunk at the foot of her bed. The doll is in very good condition. The markings are hard to read but I can make out either an AJ or AC on the nape part of the neck. I am very interested in finding out how old the doll is and the value. If anyone could help, I would greatly appreciate it. Here are some pictures of the doll. 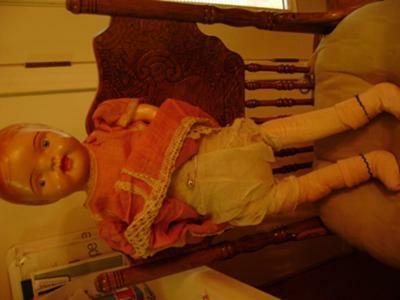 Comments for Need help with antique doll. Diane, I'm not sure about the AJ on the doll's neck. It's real hard to make out and that was just my guess. Her head and neck are made in to one piece. The shoulders are made in with the cloth body. The arms are hooked together through the body. Id there anyway I can find the value of this doll or do you know who I could contact to find out? If it would help, I can post a photo of the back and front of the doll without the dress on. American Character Doll Co., Inc. began their line of dolls about 1919. Page 18 shows a blonde wigged doll that looks very similar to yours. She has a composition shoulderplate head, molded hair under the blonde mohair wig, decal eyes: composition arms, cloth body and legs made in 1916-1920s. Unusual identifying feature: decal eyes. Dolls were issued with molded hair, more expensive models with mohair wigs. The doll shown is 24 inches. Marks: A.D. Co.
Found no company with AJ. Your doll fits into that time period. Your doll's face and body fits the description. You did not give her measurements or if she has a shoulderplate.